Mark and Sandy, owners of Renzaglia Wines, have developed their wine business, and life in general, on the idea that we should “live simply so that others may simply live”. They craft their wines only from cool climate grapes grown their vineyard in O’Connell and from other vineyards within 30km’s of O’Connell. 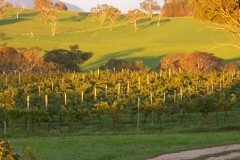 Mark is the winemaker and makes their wines at a friend’s winery nearby (Vale Creek Wines). Complete your details below and your enquiry will be emailed directly to Renzaglia Wines. Please check your contact details are correct to ensure the quickest possible reply.